Like an arrow from Cupid, this handsome Red Arrow makes you fall in love with FPV racing immediately. 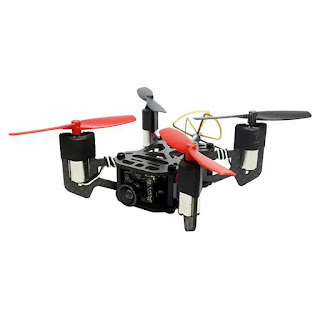 It is as affordable as any other racing drone, but much more portable, elegant and intelligent. Shiny, smart, stylish, it is the best ALL-IN-ONE racing drone that EVERYONE CAN FLY. With the integration of frame, flight controller, power system, you just need to unfold the motor arms, secure them, and install the propellers. It just takes you about 2 minutes to prepare the first flight out of the box. 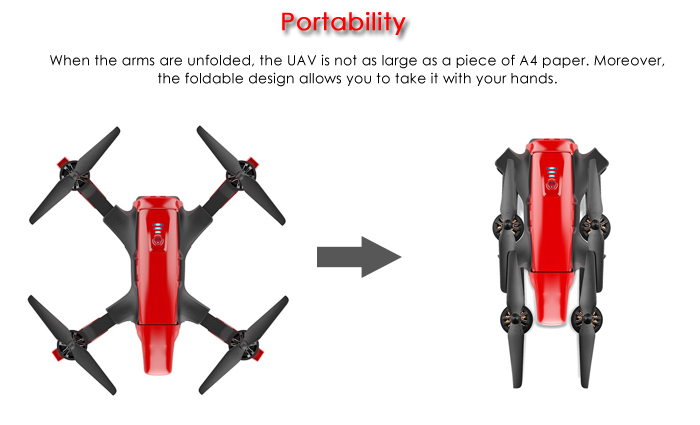 The Red Arrow has a reasonable size with a sleek airframe and foldaway arms, making it possible to be dropped into a backpack and taken to wherever you like. With optimized algorithms providing multiple flight modes, it is suitable for the beginner and also for the intermediate and advanced pilot. They can choose the speed they like and have great fun in flying the Red Arrow. The high-efficiency brushless motors generate enormous thrust and effectively raise the maximum racing to 20m/s. 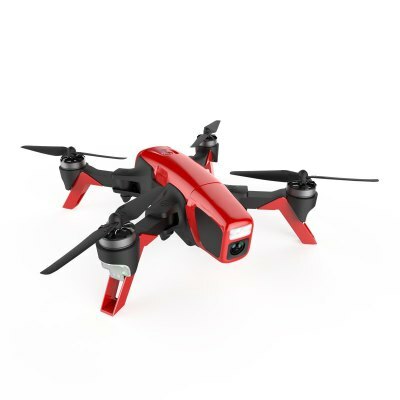 With built-in 3S intelligent LiPo, the flight time extends up to 15 minutes. Users can interact with the Red Arrow better thanks to the unique design of the professional remote control with sensitive joysticks and a dial switch. The transmitter also provides easy access to One Key to Take off / to Land. Usually, the forward direction of a flying racing drone is the same as the nose direction. By using Intelligent Orientation Control ( IOC ) , wherever the nose points to, the forward direction has nothing to do with the nose direction. IOC is a very useful tool which can help you achieve perfect shots or get out of a sticky situation. Move the flight mode switch to the position of the beginner flight mode and the beginner pilot will be able to experience the low flying speed and learn how to fly a racing drone both safely and inexpensively. The 5.8GHz analog video transmission module is integrated into the ground receiver terminal, which contributes to an ultra-low latency video transmission. 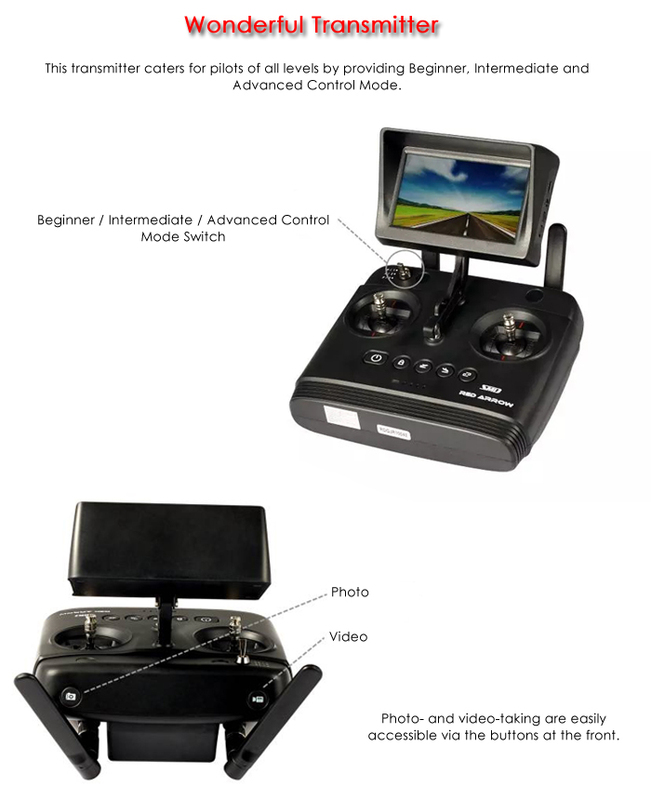 The 2.4GHz 8-channel multi-functional transmitter provides users with three flight modes - IOC, Advanced and Beginner Mode. Anyone can easily take a photo or record a video by dialing the corresponding buttons. The control range is up to 300 meters. The front LED lights show the orientation of the aircraft, while the rear ones serve as status indicators. The pilot can set up his favorable color before takeoff. When the pilot brakes the aircraft, the screen will display red.